Delahaye only built six 12-cylinder Type 165 models in the late 1930s, as production variants of the successful Type 145 competition car. 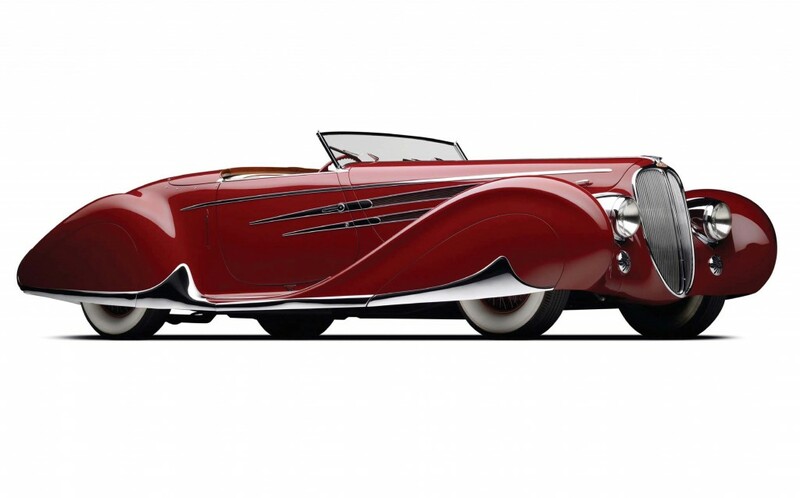 This stunning Figoni et Falaschi-bodied cabriolet was built to represent France at the 1939 New York World’s Fair, an exposition promoted with the slogan “Dawn of a New Day”. While the engine was not completed in time for its display, the modernity and sublime beauty of this car’s flowing styling drew throngs of admirers from the press and public alike. With Europe engulfed by war by the World’s Fair’s close in 1940, the U.S. Custom’s impounded the Delahaye in New York for the duration of the conflicts. In 1946 Beverly Hills car dealer Roger Barlow purchased the car at public auction, and later that year the Type 165 was fitted with a tuned Cadillac engine. After three decades of changing hands around the United States, Jim Hull and Peter Mullin bought the car in 1985 and began its restoration, purchasing its original engine from Count Hubertus von Doenhoff. This car is now owned by Peter and Merle Mullin and the Peter Mullin Automotive Museum Foundation, where is its displayed in Oxnard, California.